So when you get a notice that says someone has selected a known relationship as, say, a third cousin, and you have absolutely no idea what your relationship to your match might be, what should you do? The answer, realistically, is: nothing. Because the odds are, the request isn’t being made because the match does know the relationship between you; it’s being made because the match doesn’t know it. And because selecting a known relationship, even where one isn’t known, activates one of the most useful features of the Family Finder interface — the “in common with” feature. Choosing a name from that list of matches will present you with a filtered list of people who match both you and the person whose name you’ve selected. So I can, for example, see only the people who match both me and my half-brother, to quickly and easily isolate those of my matches who’ll be on our shared paternal side, eliminating all those on my mother’s side. Or I can choose my Fore cousin and identify people who’d be the best to contact to try to work on that line, in which my cousin and I share a set of third great grandparents. Or I can choose my grandmother’s cousin whose most-recent-common-ancestor with me is the Shew-Battles line — her great grandparents and my 3rd great grandparents — and isolate only those likely to share that lineage. It’s an absolutely wonderful tool when you want to work on one segment of your DNA matches at a time and essential to making sense of your results. But here’s the kicker: the only matches who will appear in that list are matches where you have gone ahead and assigned a known relationship. Pretty clear that I’m going to be looking on my mother’s Cottrell side and not my father’s Geissler side, isn’t it? And if we continued to look down the list, we’d see that Robert matches a number of my other matches who share one surname from one area of North Carolina as well. Which tells me even more precisely where Robert and I should look to find our common ancestors. The key here is that Robert doesn’t have to confirm the relationship for me to be able to use this feature. And I wouldn’t need to confirm it for him to be able to use it if he’d assigned it at his end. So what should you do when a DNA match uses a feature at the website that allows that match to select a “known relationship” with you, and you don’t know anything that will confirm it? … Or everything you can to learn enough to confirm it! Thank you VERY much! This explains “in common with” thoroughly! WOW! Glad I could help, Janette (who, for lurkers, is a Wiseman cousin of mine)! Great article Judy, and timely, I had just received one of those notifications but wasn’t aware of the In Common functionality at all. Certainly makes the results set a bit more useful! Thanks so much for clearing up some questions I have. A little LESS confused. Question: in the automosmal testing I have been match with a lot of folks who share my surname. Do they put in REAL matches with my surname that share my DNA or are they just giving me folks that have the same last name? It really is quite frustrating because I can find no common ground with them and of course not many folks answer you back or have Private trees. I just want to be sure they actually share a surname and my DNA. The only people who show up as matches are people who share your DNA, whether they share your surname at all. HOWEVER if you have tested with AncestryDNA, be aware that those reported as distant cousins may be false positives — Ancestry reports many more matches than other companies on the theory that they might be useful even if they turn out not to be actually related to you. Being able to see who’s in common is great, but having to set everyone to Distant Cousin is a real pain… especially since people who don’t understand it like to re-set so that it no longer shows as anything and can’t be used (meaning it has to be re-set). Seems to me FTDNA should automatically let us see matches in common. That’s big on my wish list, along with 23andMe letting us compare more than 3 at a time. No disagreement from me on either of those, Karla! Thanks for this article Judy, I hope many FTDNA customers read it. I agree with Karla, I tried assigning ‘distant cousin’ so I could work out what matches were ‘in common’ with each other among my father’s matches. Some people deleted the request rather than ignoring it, I guess because they didn’t know how useful the feature is. I became worried then that I was annoying people with my ‘distant cousin’ assignments, which was the absolutely opposite of what I wanted to do. Now I assign ‘distant cousin’ one match at a time, check who matches in common, make notes, and then delete the ‘distant cousin’ request. It would be so much easier if the ‘in common with’ feature was available for all matches. Thanks for another great & educational post Judy. I wasn’t using this feature until I read your post, and it really opened my eyes to an incredible tool. It’s really added to my clarifying the results I’ve seen at FTDNA for my self & my family. 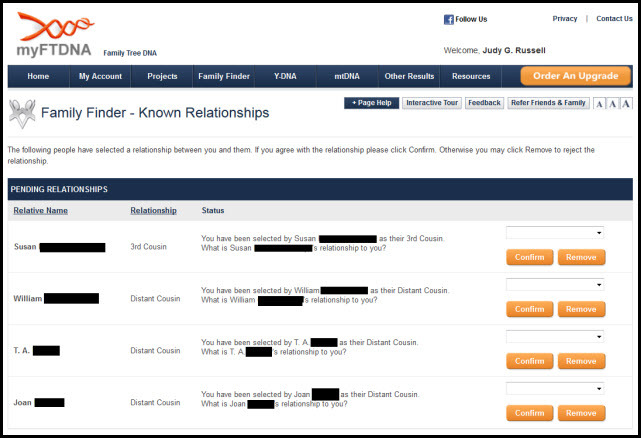 Sadly, there are a few “heated” comments recently on the FTDNA forum under “Family Finder” section & “New Matches Coming In”, regarding tagging someone as a “distant cousin” before confirming the connection. Happily, you’ve given me the understanding that some of those posters are missing. Thanks! I understand why people aren’t comfortable being tagged as part of a “known relationship” when the relationship isn’t known, Jim… but it really is just a matter of terminology, given the use of this feature! 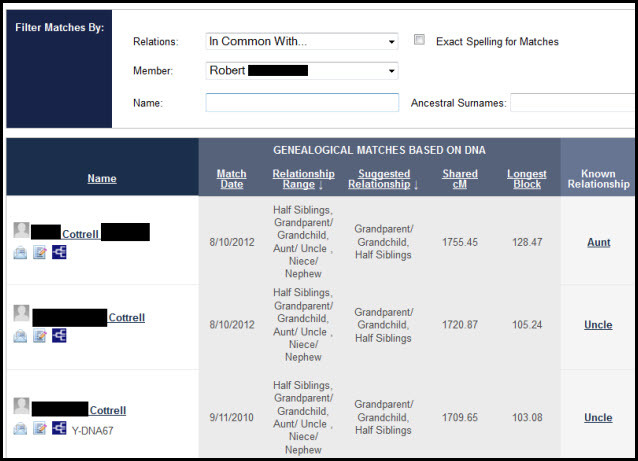 I used to use the Family Finder “in common with” feature all the time, but since FTDNA’s recent website overhaul, it seems to have disappeared. Without it, I barely have any use for Family Finder. Can some please help me find “in common with” on the newly configured page? Underneath each match name, to the bottom left of the photo or male-female icon, is a little arrow. Click on that to open advanced view for each person, and one of the options there is triangulate. Click on that and you’ll see your “in common with” or “not in common with” options. You can also change the view for all matches to show this optional bar by toggling the Show Full View / Show Simple View link at the top left of your match list.